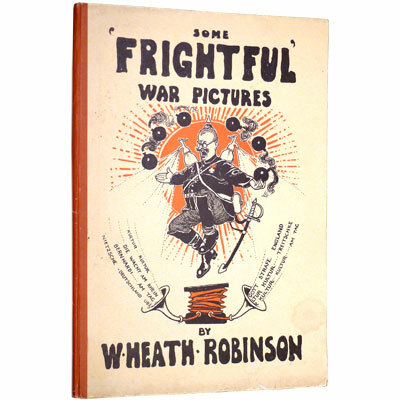 Some ‘Frightful’ War Pictures - W. Heath Robinson 1915 - Duckworth & Co., London - First Edition	A bright and large folio first edition of W. Heath Robinson’s World War I era anti-German cartoons, with 24 full pages half-tone illustrations, illustrated title page and endpapers, with his fabulous drawings of unlikely situations, machines, ever-more-unlikely secret weapons, and various comic contraptions, each with amusing titles such as ‘The Trench Presser or Bosch Bayoneter’, ‘Using Syphons of Laughing Gas to overcome the British before an Attack in Force ’, ‘A Swiss Shepherd watching a Battle on the Frontier’, ‘Stiffnecking Tommies by directing Draughts on the British Trenches’, and ‘A Morning Tub on the Imperial Campaigning Car’. This collection of Robinson’s war illustrations had previously appeared in ‘The Sketch’ and in ‘The Illustrated Sporting and Dramatic News’. His cartoons of bizarre and improbable machinery were so popular that Britain later adopted the term ‘Heath Robinson’ to refer to absurd inventions. William Heath Robinson (1872-1944) was a prolific British cartoonist and illustrator, best remembered for his illustrations for the 1913 Hans Christian Andersen collection of fairy tales, along with other classic children’s stories, as well as the books he wrote and illustrated himself, The Adventures of Uncle Lubin and Bill the Minder. He later became known for his absurd drawings of fantastic machinery and devices. References: Horne, The Dictionary of 20th Century British Illustrators 373.